LakeAir manufactures quality smoke eaters used in the home, and in social, commercial and industrial environments. They are simple to use and work great. They remove smoke created by a number of different processes. Let’s look at what smoke is. We will examine briefly how it is produced. Finally we will look at solutions for smoky rooms where you work, live and play. The amount of smoke depends on fuel and the amount of oxygen being burned. If more oxygen is available you have a higher temperature and less smoke. Cigarettes and cigars burn at a low temperature. Therefore they create a lot of smoke. We usually think of smoke that comes from cigarettes. Many manufacturing methods create fumes. Welding creates gases high in metal oxides. Materials like plastic and adhesives produce smoke with nitrogen oxide. Textile manufacturing produces carbon monoxide. Regardless of what is making the smoke in your world, LakeAir has a smoke eater solution to protect you. If we are talking about cigarette smoke the best answer is probably you. Quit smoking or do it outside! But, if you are reading this, that answer is not working for you. 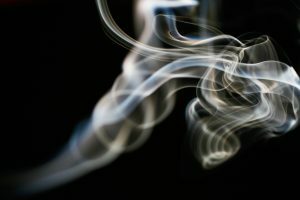 Smoke is a byproduct of many useful manufacturing methods. Your manufacturing pays the bills and smoke free technology may not be available or costs too much. Good ventilation removes much of the smoke from an area. However reheating or cooling the air is our homes or businesses is costly. Makeup air can be a part of your clean air solution. It usually is it not enough. Cleaning the air works the best. A quality smoke eater will purify the air and save money on heating and air conditioning. Health hazards are reduced. Products have higher quality. Equipment lasts longer. Everyone is happy. We learned that smoke is made up of solid, liquid and gas particles. Different technologies can be used to remove these particles. Media is a filter made of cotton or synthetic woven materials. The fibers catch the particles as they pass through the filter. Media filters are rated by a MERV rating standard. Filter are rated 1to 20. MERV 11 is the lowest rating that will remove smoke. Some media is treated with a charge. This has little effect on its ability to remove smoke. 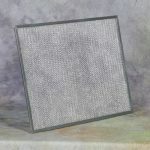 HEPA filters are effective on removing smoke. They remove 99.97% of particles. However, they have drawbacks. They filter a smaller amount of air. A HEPA filter on its own cannot remove the odor of smoke. 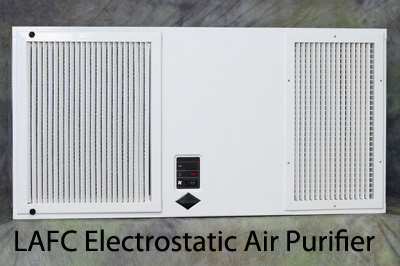 A LakeAir Electrostatic smoke eater uses 2 types of air filter technologies. The first air filter is an electrostatic precipitator. Smoke given an electrical charge in the first section. In the second section the smoke is attracted to the aluminum plates just like metal to a magnet. The smoke particles are trapped on the plates until It is washed away. Our electrostatic cells are 97% efficient on smoke particles as small .01 microns. 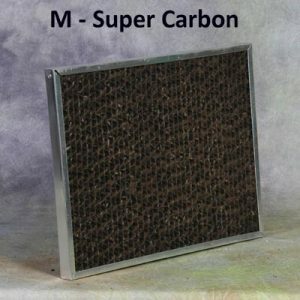 After the After the primary filter has removed the pollution particles, the air moves into an activated carbon filter. 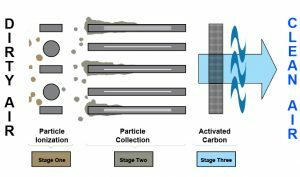 How is activated carbon made? 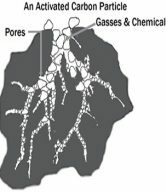 Activated carbon is carbon that has been treated with oxygen. The treatment gives carbon millions of tiny holes. These tiny holes give the charcoal a tremendously large surface. The gases pass through the charcoal where it is trapped. This process is called adsorption. Activated charcoal absorbs smoke odor like a sponge. It is the best product known for removing this smell. Every smoke removal solution should include activated charcoal as part of its air cleaning system. Each granule of carbon has a specific amount of odor it can hold. When a carbon granule has adsorbed as many odors as it can, it is saturated. The filter then needs to be replaced. There are over 150 types of activated carbon. 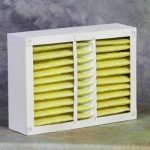 LakeAir carbon filters use high quality carbon manufactured specifically for the removal smoke odor and othercommon gasses and VOCs. An ozone generator pumps out ozone to quickly wipe out any odor. Ozone is very effective on odor. It is considered to be a hazardous chemical by the EPA. Ozone generators do not remove particulate from the air. Except for specific uses in areas where there are no living things, ozone generators should not be used. 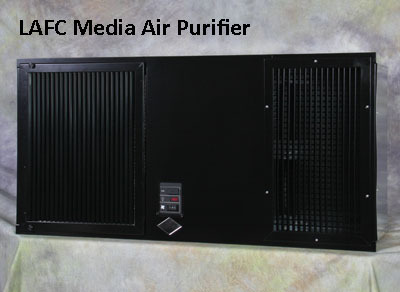 The LAFC Media Air Cleaner is our low price point offering. It uses a disposable MERV 11 media filter. This unit is suitable for commercial and residential buildings. It removes mold, pollen, and pet dander. Replace the filter as needed. The LAFC Media has a 3 stage filtration system; Pre Filter / MERV 11 Media Filter / Activated Carbon Filter. The LAFC HEPA is 99.97% efficient on smoke and suspended particles. 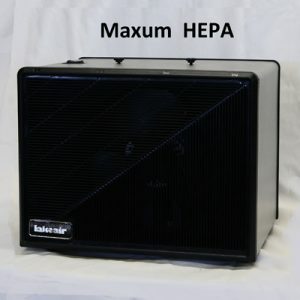 Our HEPA filters are certified to be true HEPA. 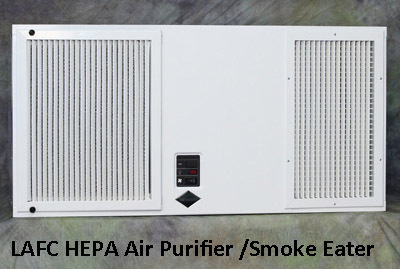 This HEPA has an integrated activated carbon filter that removes odor. The LAFC HEPA uses 2 powerful blowers to deliver clean air to your customers and workers. The LAFC HEPA smoke eater provides clean quiet air filtration. 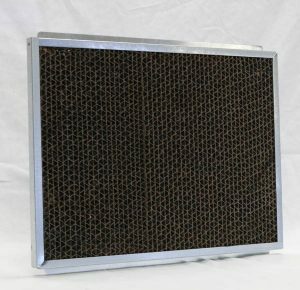 Our replacement filters cot 60% less than the competitors. A LAFC mounts in a 2 x 4 ceiling grid. It can be mounted in a standard drop ceiling. It only needs 11 inches of clearance. The LAFC weighs only 87 pounds. 4 (1/4 – 20) eye bolts help support it from the ceiling. 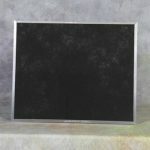 A swing down panel allows easy access for filter maintenance. This unit is powerful and nearly invisible. It can purify a room up to 35 x 35, 4 times an hour. We have redesigned the super carbon for the LAFC. This new filter provides 20 times more carbon than our standard carbon. The part number is 499039. This new filter will remove all odors including the odor of cigarette smoke.The new filter will fit all LAFC models. The electrostatic model has a slide in feature. The Media and HEPA use 2 sided tape. The LA series is designed to be hung from the ceiling. With an optional mounting bracket they can be mounted to the wall. Many times in industrial applications these units are mounted on carts. This allows them to be moved from area to area as the need for clean air changes within an operation. The LA1400 Electrostatic is a great entry level commercial smoke eater. It is perfect for smoking rooms and kitchens to 1500sq ft. The filter cell is washable and 100% reusable. The LA1400 has a 4 stage filtration system; Pre Filter / Particle Ionizer / High Voltage Particle Collector / Activated Carbon Filter. The LA2000-S uses 2 electrostatic cells for double purification. It pumps out 2100 CFM of clean air for your commercial or industrial application. All LA 2000s are built from 14 gauge steel. This unit is the king smoke eater. The NEW LA2000-OC offers ultimate odor control. It uses a 16” x 20” electrostatic cell to trap smoke and particulate. It has a huge 10 lbs. carbon filter to remove odors. The NEW LA2000-H has a 6 inch true HEPA and a 7 pound carbon filter. 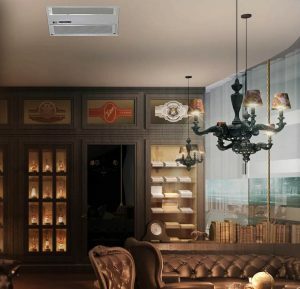 It produces 1200 CFM of extra clean air for ultimate odor control. Try our newest HEPA smoke eater in your shop or bar. Smoke, fumes and gasses are the byproduct of many manufacturing processes. These facilities often need a more industrial approach to fume control. A LakeAir Industrial smoke eater is a perfect fit for this niche. We have supplied purification solutions for many industrial processes. The LA 2000 is great for commercial food manufacturing and fabric processing. Industrial applications include welding and metal fab shops Call to see if the LA2000 is the best smoke solution for your application. 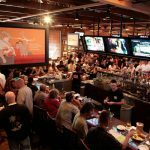 Social smoking venues are becoming more popular. Cigars are more popular than ever. Our products are found in many fine cigar bars. Hookah lounges are very popular with younger smokers. The water cooled and flavored smoke has to be removed from the air. Private Clubs like VFW’s FOE’s and Lodges often allow smoking and use our smoke eaters regularly. 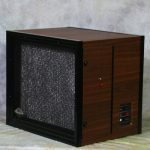 A LakeAir air purifier will remove cigar smoke. This will keep your man cave a welcome part of your home. Our commercial smoke eater cleans the air in your business establishments. Clean air helps retain valuable customers. These units easily pay for themselves over time. They lessen the high cost of makeup air. There is no reason to reheat or cool outside air when you have a healthy supply of clean air. We use high grade components made of steel, aluminum, and tungsten instead of plastic. 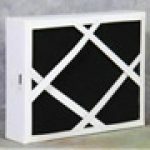 Washable filters cost less to maintain than standard fair filters. The electronics have a 7 year warranty and are built to last. The LakeAir Products protect your family from the dangers of smoke. This product offering gives big savings on a commercial smoke eater for the home. A residential smoke eater protects more than your family. It protects your home from the effects of smoke. A recent study showed that homes with smokers could sell for up to 29% less than similar homes without these issues. On a $230,000 home that could lead to a loss of more than 66,000 Dollars. Removing smoke stains from walls and ceiling is a lot of work. Many times you have to repaint your home with expensive primers and paint. Removing smoke odors from carpets and drapes is a costly process. Quite often you have to rip out the existing carpet and replace it with new. Cats, dogs and birds are particularly sensitive to 2nd hand smoke. Our pets have smaller bodies and smoke affects them more severely. A home smoke eater will protect your pets from 2nd and 3rd hand smoke. What’s 3rd hand smoke? Third hand smoke is the residue that remains on skin, fur, clothing, furniture. The residue remains after the air has cleared. Every cat owner knows that cats are meticulous groomers. Your Siamese cat is cleaning more than dirt and dust off her fur. Your cat can’t stop these toxins that fall from smoky air. She can’t help but “eat” them when she grooms. Cats who live in a smokers home are 4 times as likely to develop lymphoma, heart arrhythmia, and lung paralysis. Cats that are not exposed to tobacco users do not have this issue. Dogs are more likely to have nose and eye issues if they live in a smokey house. There life span is often shortened. Birds have smaller bodies and are even more likely to suffer from your cigarettes. Home smoke eaters can stop many family arguments before they even start. 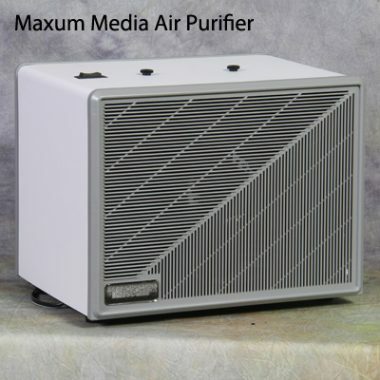 The Maxum electrostatic air purifier is very quiet at only 49 decibels. this unit removes more than the smoke you see. It removes countless air pollution particles and fumes that are dangerous to the health of all. The Maxum removes smoke from all sources around the home. Confine smoke creating activities to one room with a Maxum inside it. This will easily keep smoke and its odors out of the whole house. Medical marijuana has been reported to have healing benefits. Many people live happier lives from less pain and discomfort. But is medical marijuana good for the whole family? according to the National Institute on Drug Abuse, the toxins and tar levels known to be present in marijuana raise concerns. Exposure can be bad for the young, old, and people with asthma. Don’t take chances with your family. The Maxum removes marijuana smoke and the effects of 2nd hand marijuana smoke. Even if medical marijuana is legal the odor can be embarrassing. Your neighbors might not know you are using marijuana legally. It is important to protect all the members of your family, including our pets from side effects of this medical advancement. Electronic Cigarettes—or e-cigarettes are designed to offer nicotine vapor without burning tobacco. A typical e-cigarette is a battery-powered device with a heating element and a cartridge filled with a liquid solution. When in use, the heating element vaporizes the liquid. It is agreed among most professionals that more studies need to look at the effect of 2nd hand vaping fumes. There is evidence that vaping indoors–even in a well-ventilated room–releases ultra fine particles and hazardous chemicals into the air. The Maxum air purifier can neutralize these threats. Other than a health concern, the vapor from an E-cigarette will leave a residue on your windows and walls. This residue is stubborn to remove. It resists many cleaners and degreasers. Your home smoke eater will reduce the amount of cleaning needed as a result of vaping. 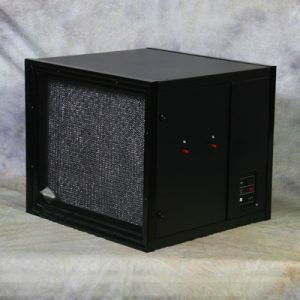 A LakeAir Home smoke eater is an commercial strength air purifier. It has an industry leading 7 year limited warranty. 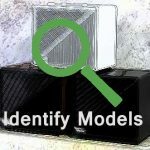 Most air purifiers bought for the home are largely plastic construction. LakeAir’s bodies are 18 gauge steel. The Electrostatic cell is made of high grade materials; aluminum, ceramic and tungsten steel. All LakeAir products are made in the USA. The electronics are super tough and built to last you many years. We often hear from customers who have had their lakeAir products for more than 20 years. You should expect a similar experience when you purchase yours. 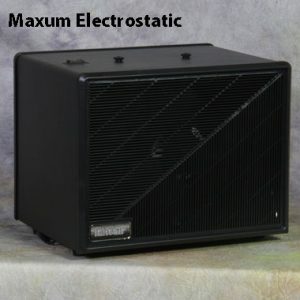 Maxum Electrostatic offers a washable filter. It removes 97% of smoke in the home in a single cleaning . Maxum HEPA is true HEPA that is 99.97%. efficient at removing smoke and all other impurities from the air in your home. Maxum Media offers a disposable MERV 11 filter. This is a great air purifier for those on a budget. M-Super Carbon fits into all 3 of the Maxum models. It provides extra odor and VOC Removal. The Home smoke eater bundle includes everything to keep smoke and odors away for an entire year. The bundle includes (1) Maxum Electrostatic Air Purifier, (2) Super-max activated carbon filters. They trap the odors from smoke for an extended amount of time. You receive total smoke and odor protection for under $600.00. We also provide FREE shipping! LakeAir air purifiers are great on smoke. They remove so much more from the air. Smoke is one of the thousands of pollutants that our products remove. Our electronic air cleaners remove dust, pollen, mold spores, pet dander, dust mites, and a host of air pollution particles. Each unit has an activated carbon filter that removes gases, fumes and odors. No matter what you need to clean from the air, LakeAir products do the job for you. All LakeAir Air Purifiers are made in the USA. They have been built in Racine Wisconsin since 1968. We do not import foreign assemblies. We cut, punch,, shape, weld and assemble our products with American labor. We offer 6 different models for this use.They work in a variety of settings. LakeAir products are great, but every machine has its limits. Sometimes you might have to combine products to achieve the desired level of air purification.